As far as winters go, this one has been pretty tame. I’ll admit, we were all shittin’ bricks when the Farmer’s Almanac came out and said we should expect a harsh, cold, Canadian winter. Instead, we’ve had some wild fluctuations in the temperatures, and inconsistent precipitation. We’ve had a few little cold snaps, but no -40, or -45c that we are good for at least a dozen times a year. Earlier this week it was -30 with the windchill, and tomorrow is supposed to be +6. I mean, seriously. How can you adapt? I can’t. So I catch myself dreaming of amazing beaches and trips I really can’t go on. It’s like having a day job, 2 kids, a dog, and a new home-business really keeps you grounded! Instead, I focus my energy on making myself amazing foods, and treats, obviously! Ha! This chocolate mousse is amazing. It’s got a thicker, more set-up consistency straight out of the fridge, and is smoother and pudding like once it comes closer to room temperature. 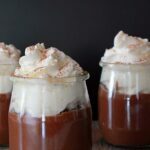 This Mexican Chocolate Mousse is rich, it’s tasty, it’s a little spicy and it’s good for you! It might not be an escape from the cold and the snow, but if you close your eyes, drown out the kids and try really hard, you can convince yourself it’s a holiday for your mouth! Avocados are kind of an interesting fruit, they are more like a nut than a fruit, in the sense that they are a highly concentrated food. They are high in calories, but the macro breakdown shows a bit of a different story. The average avocado has ~30g fat (settle down, good, healthy fats! ), 12g carbohydrates, and 4-5g protein. They are quite high in most B vitamins, except B12, and are especially abundant in folic acid, niacin, and pantothenic acid, and vitamin A. Avocados are also rich in potassium, magnesium, iron, and manganese. Both cacao and cocoa come from the same plant, the cacao tree, and the main difference between cacao and cocoa is that cocoa is that cacao is made by gently heating fermented cacao beans to remove the fatty, buttery parts (cacao butter) then milling the beans into a fine powder, while cocoa is cacao that has been roasted at higher temperatures. Cocoa is slightly sweeter and less acidic, be sure to look for a cocoa powder that doesn’t contain fillers or added sweetners. The raw form, cacao powder, is considered a superfood, and while cocoa is no nutritional slouch, it simply doesn’t have the same antioxidant properties as cacao. Research is actually pointing towards cacao as having anti-depressant properties! Combine all ingredients in a high speed blender, I use my Vitamix, and blend until smooth. Transfer to small serving containers and place in the fridge until set - 2-3 hours. Eat immediately or keep covered in fridge for up to 3 days. Top with whipped cream just before serving, if desired. Lovely recipe… this one is a must try on my list! How many servings does this recipe make? Looks delish & want to take to a party of 10 ppl.